Malocclusion is a disorder affecting normal development of the occlusion and has a multifactorial etiology. Factors such as socioeconomic status and parents education have been associated with higher prevalence of nonnutritive sucking habits (NNSHs) which lead to malocclusion. The objective of this study is to assess the influence of factors such as parents education, birth rank, socioeconomic status, duration of breastfeeding on NNSHs, and the effect of these habits on dentition. A cross-sectional survey was conducted through a questionnaire and clinical examination. The sample size was determined using open Epi software 2.1.3 version (Centres of disease control and prevention, georgia, USA), with power of 80% and confidence interval level 95%. The estimated sample size was 230. Ethical approval to conduct the study was given by Saveetha University, Chennai (SRB/STUG15/42). The study included 400 children, out of which 230 children had NNSH. The questionnaires were distributed to the parents of all these children. The questionnaires included a written informed consent form that was filled by each parent. The exclusion criteria included children with any kind of chronic illness and disability. The questionnaire included questions on parent's education, socioeconomic status, duration of sucking habits, birth rank, child's previous or persisting sucking habits, methods used to intervene, and duration of breastfeeding. The assessment of malocclusion was done in children with both primary and mixed dentition. All the examinations were done by one examiner using mouth mirror and pen light. The assessment of malocclusion involved the following parameters of degree of overbite, amount of overjet, and posterior crossbite. Intra-examiner reliability was assessed at 15-day interval and had a kappa value of 0.8. The data were collected over a period of 3 months. Data entry was done in SPSS version 18 (IBM corporation, Chicago, US) and statistical analysis was performed. Chi-square analysis was used to analyze the association of NNSH and malocclusion. A total of 230 children participated in the study, of which 57% were boys and 43% were girls. Of the 230 questionnaires distributed to the parents of children who were part of the study, 61% of the parents found that their child had a digit-sucking habit while 21% of the parents found that their child had a dummy-sucking habit. Fifteen percent of the parents found that their children used other objects for sucking apart from digit or dummy objects while 3% have noticed that their child possess both digit- and dummy-sucking habit. This is illustrated in [Figure 1]. It was seen that 73.9% of the children had 2-5 h duration of sucking habit while 18.3% had duration of less than an hour and 7.8% >6 h. The duration had much a significant relationship with the prevalence of the habit as shown in [Table 1]. 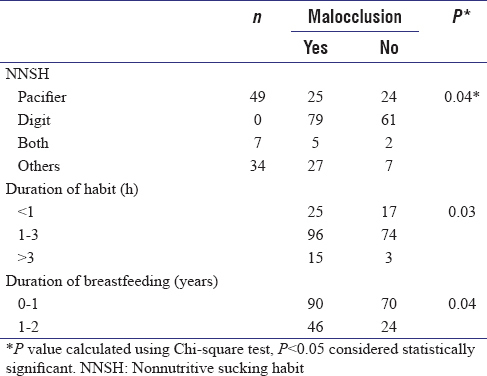 In the present study, it is seen that 33.8% had malocclusion when breastfed for 1-2 years while 66.2% were found with the presence of malocclusion with a breastfeeding duration between 0 and 1 year as shown in [Table 1]. According to this study, it is seen that 17.8% of the children with digit sucking had parents with middle school level of education and 47.4% of the digit suckers were found to belong to the lower economic status of the society as illustrated in [Table 2]. Studies show that participants had a higher frequency of finger sucking in relation to other objects or the pacifier , since the finger is always more accessible than the pacifier. The present study also shows that digit sucking is more common than dummy sucking as children also have easy access to their fingers and these children are usually not exposed to pacifiers. It was reported that in the district of Baghdad, the percentage of children having increased overjet, overbite, openbite, and crossbite is higher in the group having NNSHs. This was in accordance with the present study which showed an increased presence of malocclusion in children with an NNSH. The findings of a study done by Wareen et al. (2002)  indicated that longer the duration of the NNSH, higher was the prevalence of malocclusion in children with mixed dentition. However, the present study did not show any statistically significant association of duration of sucking and malocclusion. This can be attributed to the smaller sample size and poor memory of the parents on the exact duration of sucking. A study conducted in Pune suggested that a reduced duration of breastfeeding leads to the child's indulgence in various NNSHs, and disturbance of orofacial equilibrium takes place which has been associated with various malocclusions. This is in accordance with the present study which shows that longer the duration of breastfeeding, lower is the prevalence of malocclusion. A study by Larsson  showed results in accordance to the present study which reported no significant relationship between the child's birth rank and the NNSH. In a study conducted in Saudi, it found that the association of parent's education and the NNSH showed that the higher the level of parents' education, the greater was the probability that the child was a dummy sucker and the findings of digit sucking did not show significant association between the level of parent's education and the prevalence of the habit. The present study showed that parents with middle school education showed greater prevalence of digit-sucking habits and this can be due to the fact that they have noticed the habit more. The results from previous studies show that family income did not predict digit- or dummy-sucking habits. ,, This in contrast to the present study showed that children belonging to the lower socioeconomic class had a higher prevalence of digit sucking. This may be due to fact that these parents had low awareness and did not take measures to intervene. The results of the study show that digit-sucking habits were found in three-fourth of the children who were part of the study. There was a significant association between NNSH and malocclusion. It was also found that there was no significant effect of birth rank and the prevalence of the habit. The duration of the habit did not significantly alter the presence of malocclusion. The limitations of this study were the small sample size and the study was done over a large area. A longitudinal study over a period to evaluate the association between various factors and NNSHs and to evaluate the association between NNSHs and malocclusion is recommended. Johnson ED, Larson BE. Thumb-sucking: Literature review. ASDC J Dent Child 1993;60:385-91. Moyers RE, editor. Etiology of Malocclusion - Heredity and Congenital Causes, General and Local Factors and Abnormal Habits. In: Ortodontia. 3 rd ed. Rio de Janeiro: Guanabara Koogan; 1991. p. 127-40. Graber TM. The finger-sucking and associated problems. J Dent Child 1958;25:5. Moss ML, Salentijn L. The primary role of functional matrices in facial growth. Am J Orthod 1969;55:566-77. Linder-Aronson S. Respiratory function in relation to facial morphology and the dentition. Br J Orthod 1979;6:59-71. Legovic M, Ostric L. The effects of feeding methods on the growth of the jaws in infants. ASDC J Dent Child 1991;58:253-5. Hanson ML, Cohen MS. Effects of form and function on swallowing and the developing dentition. Am J Orthod 1973;64:63-82. Venetikidou A. Incidence of malocclusion in asthmatic children. J Clin Pediatr Dent 1993;17:89-94. Warren JJ, Bishara SE. Duration of nutritive and nonnutritive sucking behaviors and their effects on the dental arches in the primary dentition. Am J Orthod Dentofacial Orthop 2002;121:347-56. Tomita NE, Sheiham A, Bijella VT, Franco LJ. The relationship between socioeconomic determinants and oral habits as risk factors for malocclusion in preschool children. Pesqui Odontol Bras 2000;2:169-75. Santos SA, Holanda AL, Sena MF, Gondim LA, Ferreira MA. Nonnutritive sucking habits among preschool-aged children. J Pediatr (Rio J) 2009;85:408-14. Paunio P, Rautava P, Sillanpää M. The Finnish Family Competence Study: The effects of living conditions on sucking habits in 3- years-old Finnish children and association between these habits and dental occlusion. Acta Odontol Scand 1993;51:23-9. Bishara SE, Warren JJ, Broffitt B, Levy SM. Changes in the prevalence of nonnutritive sucking patterns in the first 8 years of life. Am J Orthod Dentofacial Orthop 2006;130:31-6. Rasheed NA. Prevalence of Thumb sucking habit and its relation to malocclusion in preschool children. Al-Anbar Med J 1963;5:321-7. Warren JJ, Slayton RL, Bishara SE, Levy SM, Yonezu T, Kanellis MJ. Effects of nonnutritive sucking habits on occlusal characteristics in the mixed dentition. Pediatr Dent 2005;27:445-50. López Del Valle LM, Singh GD, Feliciano N, Machuca Mdel C. Associations between a history of breast feeding, malocclusion and parafunctional habits in Puerto Rican children. P R Health Sci J 2006;25:31-4. Larsson E. Dummy- and finger-sucking habits with special attention to their significance for facial growth and occlusion 1. Incidence study. Sven Tandlak Tidskr 1971;64:667-72. Farsi NM, Salama FS. Sucking habits in Saudi children: Prevalence, contributing factors and effects on the primary dentition. Pediatr Dent 1997;19:28-33. Yarrow LJ. The relationship between nutritive sucking experiences in infancy and non-nutritive sucking in childhood. J Genet Psychol 1954;84:149-62. Larsson E. Dummy- and finger-sucking habits in 4-year-olds. Sven Tandlak Tidskr 1975;68:219-24. Larsson EF, Dahlin KG. The prevalence and the etiology of the initial dummy- and finger-sucking habit. Am J Orthod 1985;87:432-5.